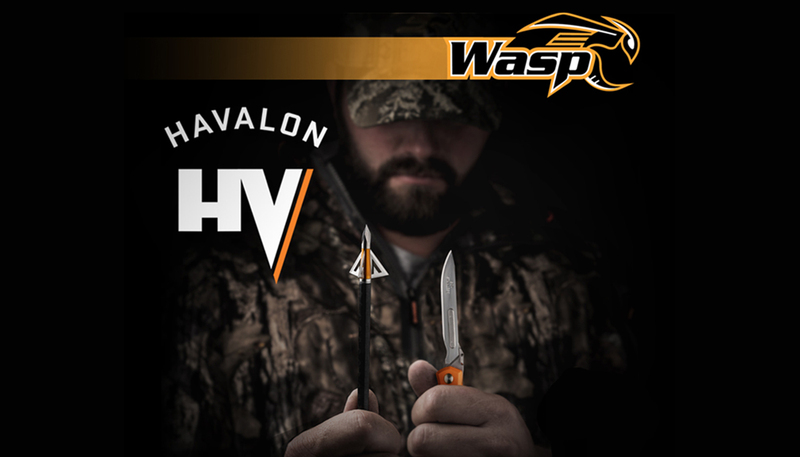 Here at Wasp, we are extremely excited to announce a dream partnership with Havalon Knives, makers of the industry’s most versatile replacement blade hunting knives. Over the past two years, designers and engineers from both Wasp and Havalon have been working together to create the Wasp Havalon HV fixed-blade broadhead – now the most lethal broadhead on the market. Here’s a bit more info on how this collaboration came together and how it’s going to provide bowhunters with an even sharper edge in the field. The formation of this partnership has been something innovative and beneficial for both sides and to any hunter who uses Wasp or Havalon products. Throughout the product development process, the two sides were able to combine their knowledge of blade technology and materials to help create the ultimate in strength, surgical sharpness, and precision. The result has been a broadhead unlike any we’ve seen or crafted and a rare advantage for bowhunters. There are a number of key factors that set the Havalon HV apart from the competition. The aerospace-grade 7075 T6 ultra-compact aerodynamic aluminum ferrule reduces surface area to provide field-point accuracy, deep penetration, and easy tuning. The surgical sharp blades of the Havalon HV deliver an unmatched combination of thickness and cutting diameter with the same precision and durability of our entire broadhead collection. The .035-inch thick surgical sharp stainless steel blades combine for a 1-3/16-inch cutting diameter. Couple that size with the industry-leading sharpness of Havalon’s blades, and you have a simply unbeatable broadhead. As higher-speed bows have become more prevalent in the field, the need for a super-tough head that will fly true has never been more important. The partnership with Havalon has provided hunters with the best of all worlds – durability and strength with surgical sharp replacement blades. As with all Wasp fixed-blade broadheads, the blades of the Havalon HV are easily replaced. Each pack of the Havalon HV comes with three complete broadheads and six replacement blades. The 100 grain broadhead is now available from our online store and will soon be on shelves nationwide. For over 45 years, Wasp broadheads have been trusted by hunters and feared by animals in every environment. Our new partnership with Havalon Knives builds on that legacy and paves the way for further innovation as we aim to provide hunters with a better way to take down their game. Our heads are loaded with time-tested technical features that deliver proven performance on every shot. Shop our products today and get your hands on the Havalon HV to take your shot to the next level. Never blame your broadhead again. Start shooting Wasp.